Very interesting. I won't venture a comment myself. These are images of Chinese mass-produced tatting. The tell-tale sign is that each segment or row is tatted individually and then another person crochets a line of stitches to join them. The stitch which intrigues you is actually crochet. The tatting is completed with many picots on the chains. Then the tops of the picots are over-crocheted. I did not mean to disparage your grandmother by any means. I feel bad to spoil a family story. These types of mass-produced doilies have been around for a long time. They are often mislabeled. The flaws arise because they do not "tat" but "wrap" the ds in a very rapid manner. Just like wrapping the bottom half of a split ring. They are paid by the piece which is why they must tat so rapidly. And unfortunately, in the past, some of this was prison work. There is a finer style of doilies with much the same pattern but you can tell it was done with care and better thread. I hope that is the case with your piece there. 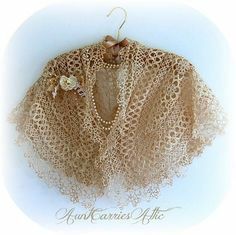 AKTATTER: on this page can you find at least 2 doilies imported from China? one in ecru and one in white? Martha Ess: How can you tell if from china, do you have to hold the cursor over each one? I saw a brief note from you before it disappeared. I know you are disappointed. I am not perfect so if you discover that I am wrong about it, I would be interested in knowing the facts you find out about it.